ST JOHN’S U21 manager Locky McCurdy faces an anxious wait to see if his leading players will be fit to line out against Ramor United in the U21 Tournament at Creggan on Sunday (12.30pm). A host of McCurdy’s squad are involved in either the county hurling or football squads with Domhnall Nugent facing the possibility of playing three games in five days. Nugent, Michael Bradley and Ciaran and Conor Johnston are part of PJ O’Mullan’s Antrim squad who are currently competing in the Walsh and McGurk Cups. The 19-year-old Nugent is also on the Antrim senior football squad with Jack Hannigan, while Matthew Fitzpatrick has been lining out for St Mary’s in the Dr McKenna Cup. With the third round of the Dr McKenna Cup scheduled for tonight (Wednesday) and with the Antrim hurlers facing University College Dublin (UCD) in their final Walsh Cup game on Saturday at Queen’s (2pm), McCurdy is keeping his fingers crossed that all his players come through unscathed. “We have seven or eight players who are involved with county hurling, football or university teams so organising training has been difficult,” said McCurdy. “We are happy enough that, if they aren’t training, they are doing something, but it has been difficult to get them together as a group. “Providing they come through Saturday’s game, they are prepared to play two games. A prodigious dual talent, Nugent is named in the Antrim team to face Tyrone tonight in Omagh and, if he features against UCD on Saturday, he will play a third game in five days at Creggan on Sunday. However, McCurdy also warned that the respective county managers must work with St John’s to ensure that burnout is not an issue. “He (Nugent) only just turned 19 last week,” added McCurdy. 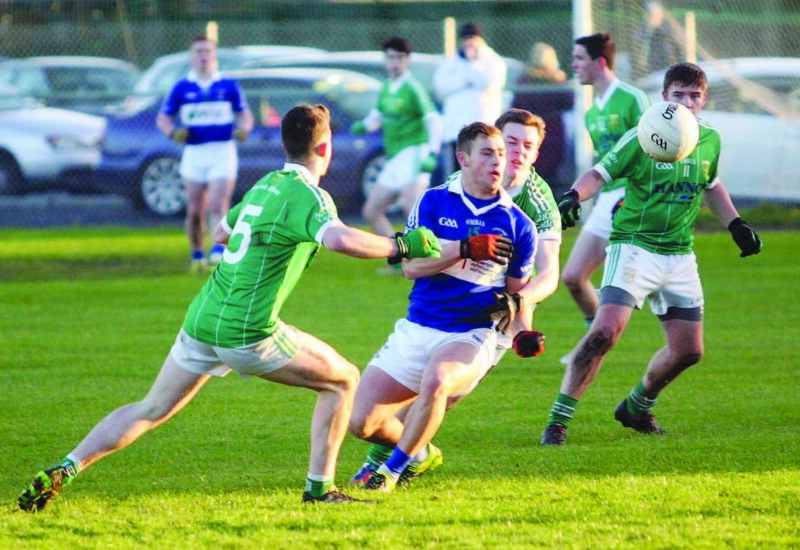 With a host of up-and-coming county stars among their ranks, St John’s had little difficulty in retaining their U21 football crown last month. Winning by an average over 15 points, emphatic wins over St Comgall’s, Dunloy and Lámh Dhearg were followed by more modest, yet comfortable, seven and five-point wins over St Enda’s and Aghagallon respectively. The semi-final and final victories demonstrated that the Whiterock Road men can cope with defensive teams as well as winning from the front. “The lads showed great character, especially in the St Enda’s and the Aghagallon games,” reflected McCrudy. “They were probably frustrating for the players, particularly the way Aghagallon set up. The standard of competition in the Ulster tournament will be another step up in class. However, St John’s illustrated last year that they can mix it with the very best teams in the province. A quarter-final win over Omagh was followed by a semi-final loss to Watty Grahams, Glen after the Derry side came from behind to defeat the Johnnies. McCurdy believes that the experience of last year will stand to his side as they seek to overcome the Cavan champions on Sunday. “We went in last year against Glen with a six-point lead at half-time and probably went too defensive and invited Watty Grahams onto us,” said the St John’s boss. “We are hoping that will stand by them and that it has given them an appetite for it. “For a lot of the lads, it is their last year at U21.